Well, it took me a long time to get back to writing about it, but the day after I posted on the stove, Mary went to Grand Forks for school shopping. She picked up an oven element at Bud and Ralph's Appliance Service for $44. Plug it in, screw in the mounts. Put on the oven door. And everything works all OK Fine. So, there are still some things one can do for one's self and save money over hiring the service. Just getting someone out to our remote area to evaluate the stove would have been over $80. Oven Repair GE JBP67 Part 1. 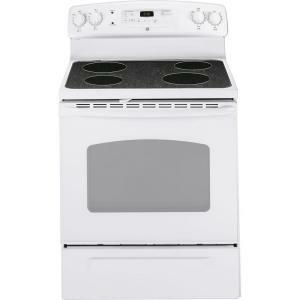 Ours is the GE Oven Range 5 cu ft. JBP67 series. We have a GE electric range with a glass top. I think stoves/appliances are built to last only a few years. My mom's GE electric range which she bought in 1971 (Avacado Green) lasted into the late 1980s, with a few heating element repairs. But these modern things, when the computer goes out, you might just as well buy a new range for what it will cost to fix. The baking element in our oven melted down yesterday. Couldn't find the manual in our file so: Google to the rescue. Following instructions in the manual I removed the oven door and took out the shelves. Note the ash at the left. We had a n overflow of a bit of apple butter but when the heating element blew it turned the spill into white ash as the element melted down. Make sure the oven is off and unplugged, you need a 6.5mm nut driver to remove the nuts at the back of the oven. It's good to use a couch cushion to keep your knees good as well. Lift the element end near you up, and pull out until the wires come out with the element . Using a flat bladed screw driver gently push the blade contacts off the heating element. Here's the heating element and most of the metal droppings it left in the oven. Keep the ends of the wires from pulling back into the insulation, and keep the screws with in the oven. Cover the ends of the wires with electrical tape to keep them insulated. Don't turn on the broiler. I leave the stove unplugged and oven door off so that everyone can see that it is being worked on. We received a couple boxes of tomatoes today. Thank you Sharon and Sharol. I've got a bunch chopped up in a stock pot working on reducing them for tomato/pizza/spaghetti sauce. But I did some of them as counter-top fermented sals. After washing and coring the stems, I slice them pretty thickly, lay them in a line crossways from the knife, slice and chop into chunks. I had onion and apples this evening, but no cilantro. I thought about adding bits of acorn after I was done. Well, I'll do that next time. I throw the onion, apple, garlic, and all the other ingredients into a large mixing bowl before adding the tomatoes. I added 1/4 c plain yogurt to this batch for starter for the lactofermentation. If you do this, use non-iodized salt. You want the lactobacillus and acidophilus bacteria to grow quickly. Iodine will tend to kill them off and your salsa will grow moldy. The amount of salt is just enough so that the salsa starts to taste salty. Mash all the stuff together and mix in the bowl. Then let it sit on the counter at room temperature for at least a day. It will start to fizz. Be sure you have a loose fitting lid or the jar will explode. Don't use a metal lid, the salt and acid will corrode the lid. It's also a good idea to set the jar inside a plastic tray. When it starts to fizz sometimes the salsa can overflow.